I’ll begin with a confession: I probably watch fewer baseball games than anyone reading this. Still, I rarely watch Reds games nowadays unless I’m doing so in person. I realize that might seem silly in a day and age where anyone with an internet connection and a few bucks to spare can subscribe to MLB.tv (and believe me, I’ve been tempted by their recent 50% off promotion), but living on the West Coast, it’s not easy to watch games that primarily begin before the end of the work day. If I could commute via public transportation, I’d love to take in a few innings on the way home, but L.A.’s urban planners unfortunately leave much to be desired. There’s also the time commitment. Baseball games aren’t exactly short, and every minute I spend watching means spending one less minute being an attentive father or husband, and it’s hard to justify the trade-off. Accordingly, I follow most Reds games nowadays via Twitter, where I can track a game’s progress in a matter of seconds. I know reading about something isn’t the same as seeing it for yourself, but I still get to enjoy the experience of following a game in real-time Ã¢â‚¬â€œ or at least as long as it takes the bloggers and beat writers I follow to tweet about what’s happening. I also enjoy the growing sense of anticipation as game days draw nearer. 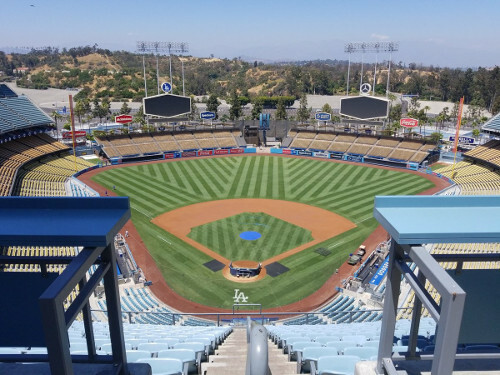 Indeed, since returning from my third visit to Great American Ball Park, I’ve been counting the days until the Reds made their annual trip to Dodger Stadium, even though they managed to win only four of 17 games there between 2012 and 2016. This year’s outlook wasn’t any rosier, as FiveThirtyEight projected Cincinnati’s odds of winning the weekend’s games at just 30%, 34% and 40% respectively despite missing Clayton Kershaw. How right they were. I’ll spare you unnecessary pain and suffering and skip recapping the games themselves, although I will point out two odd coincidences Ã¢â‚¬â€œ I’ve now seen two Reds starting pitchers get injured this year after being struck by baseballs in the second inning, and I’m apparently Raisel Iglesias’ bogeyman, as I witnessed the two appearances that book-ended his recent scoreless streak. Hopefully he’ll return to form once he’s safely out of eyesight. By this point, I’m well-conditioned to expect the Reds to lose when they visit Los Angeles, so it’s honestly not that disappointing when they do, Iglesias’ epic Sunday meltdown notwithstanding. 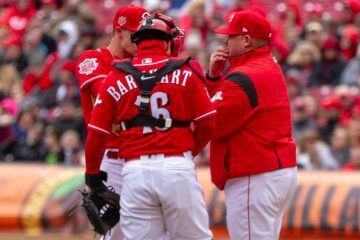 I’ve learned to appreciate the fleeting moments of joy Ã¢â‚¬â€œ Joey Votto’s 9th inning home run in an otherwise tepid Friday defeat, the apparent return to form of Devin Mesoraco, some slick defense by Eugenio Suarez, the powerful bats of the corner outfielders on Sunday Ã¢â‚¬â€œ and hope that they bode well for the team’s prospects in seasons to come. Indeed, despite my reservations about the team’s current skipper, I’m as optimistic about the Reds’ future as I’ve been in several years. Sunday’s heart-breaker would have surely been tougher to stomach had I not made plans to catch yesterday’s getaway game against the Padres. I don’t make the drive every year, as the Reds’ annual series in San Diego typically falls immediately after their visit to L.A., and it’s hard to justify devoting more time and money to baseball again so soon. This season, however, I wanted one last chance to see the team in action before reverting to tweets and recaps. And even though it’s a season for sorting, I was also hoping to witness a win. My biggest disappointment about yesterday’s game was not having one final chance to see Zack Cozart Ã¢â‚¬â€œ who was sidelined with a sore quad Ã¢â‚¬â€œ play while wearing a Reds uniform. It’s hard to believe that just a few years ago, we were complaining about Dusty Baker routinely slotting him second in the batting order Ã¢â‚¬â€œ a position he now clearly deserves. Best wishes, Zack, and enjoy that donkey. As for me, today I’ll start looking forward to my next Reds rendezvous Ã¢â‚¬â€œ spring training. While it was sad to say goodbye yesterday knowing it would be another nine months until we’d cross paths again, it was also exciting to imagine how the team will look then Ã¢â‚¬â€œ a starting rotation anchored by a healthy Homer Bailey and Anthony DeSclafani; perhaps an infield of Senzel, Suarez, Peraza and Votto; and an outfield of Jesse Winker and… well, your guess is as good as mine. In the meantime, I’ll keep watching, albeit through others’ eyes, 140 characters at a time. 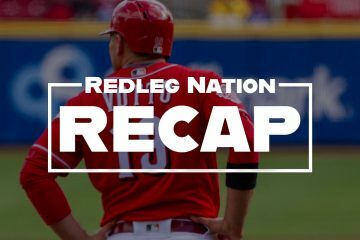 Podcast — RNR #172: The 2017 Reds Draft Extravaganza! I was in San Diego this week with my family and went to all three games. That ballpark is definitely where home runs go to die. There were about 5-6 that would have been easily out at GABP for several Reds hitters, two for Votto. Also the Padres had this weird shift that I noticed in games 2 and 3 where they were shifting away from the pull side in the outfield, for Votto the right fielder was was in right center. They showed that shift on TV. I’ve never seen an OF shift that extreme. The CF was playing in straight LCF. The LF was about 15 yards from the line. The RF was pulled to RCF. And the infielders were shifted the other way. It’s a shift that makes sense, Votto’s line drives tend to head to LCF, his ground balls are usually pulled. Aligns with his swing trajectory which minimizes pop ups. If only that 2-run sixth-inning bomb off of Garrett (which came right on cue as I rhetorically asked my friend how much rope he’d be given) would have died too! I’m guessing it still hasn’t landed.